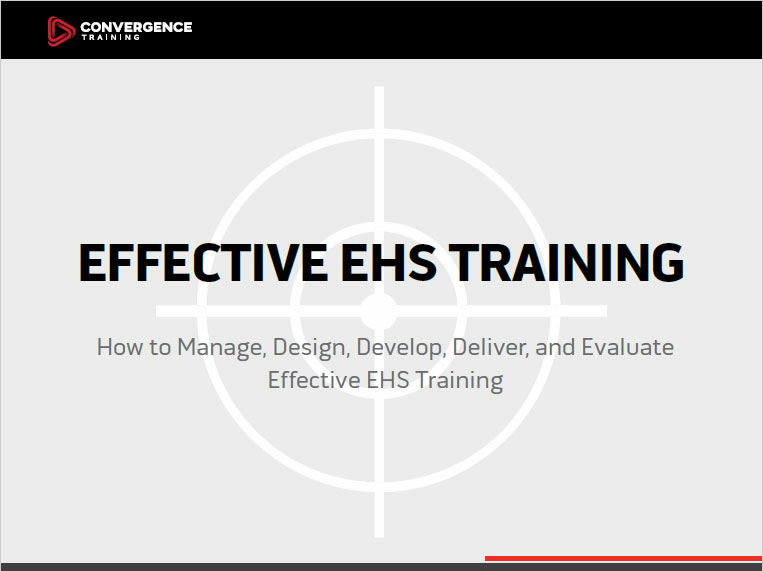 Convergence Training are safety training experts. Click the links below to learn more about how we can help you. 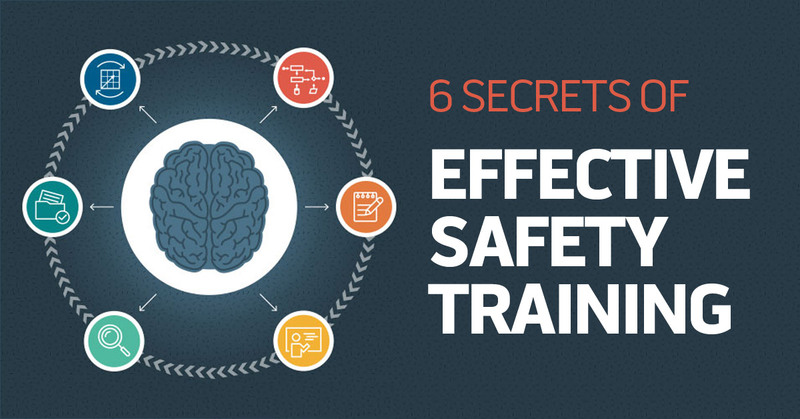 There are six steps to creating better safety training. We’ll explain each in detail below, but before we do, check out the image below. We’d like to direct your attention to two things in the image above and tell you one other thing, too. First: If you look at the image above, you’ll notice it’s a never-ending cycle. You keep doing this and doing this. It’s not a one-time thing. Look at it as job security! Third: Although it’s not represented in the image above, each of the six phases of effective safety training require competent management to ensure they are all properly performed and that they work well together. When you perform a training needs analysis, you identify the safety “problem” you’re trying to fix and determine if safety training is the best solution for the problem. In some cases, you’ll find that safety training isn’t the right answer. For example, if someone’s cut their finger with a sharp blade, installing machine guarding may be a more effective solution. In other cases, though, you’ll determine that safety training is the way to go. In those cases, you move on to the next step. Once your training is complete, how will you know if it had any effect? One way to measure the impact of your safety training is to identify the safety metric (or KPI) that should change if the training is effective. Once you’ve identified it, begin keeping tracking of it. Then compare it to post-training data to determine if your training moved the needle in the desired direction. In some cases, your safety training will be primarily focused on creating awareness. In other cases, though, you’ll want to teach workers to be able to perform specific skills and procedures in a safe manner (often following an SOP). In those cases, you’ll want to break the procedure down into specific steps. This will help you prepare to teach the steps of that procedure to workers. The next step of designing safety training is to determine your learning objective (or objectives). Put simply, the learning objective is what you want employees to be able to do on the job when the training is over. In some cases, your learning objective may be related to awareness: For example, maybe you want employees to know that hydrogen sulfide is toxic, smells like rotten eggs initially, loses that smell after a short period of exposure, and is heavier than air and so stays close to the ground when released. Or in other cases, your learning objective will be related to a skill, behavior, or procedure the employee should perform on the job. For example, you may want to see the employee demonstrate that he or she can safely operate a forklift. Once you’ve created your learning objectives, they should function as a road map for all the rest of your training. 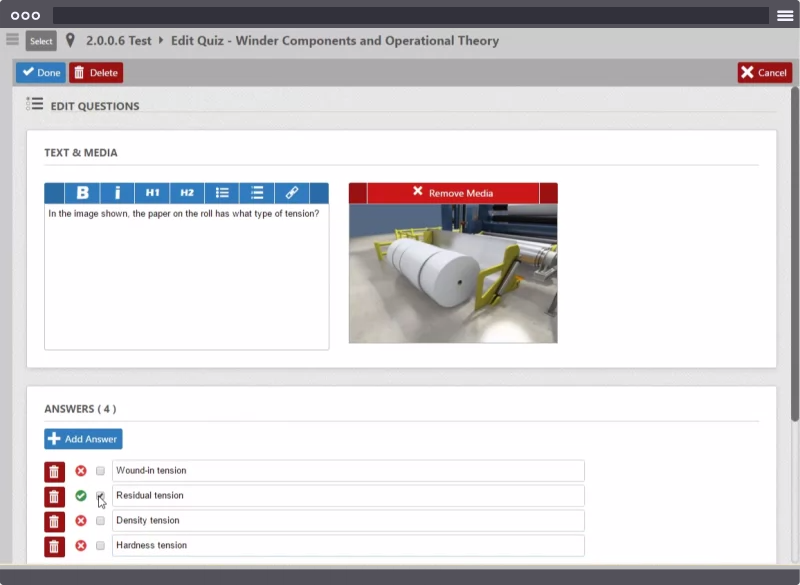 You should create training content to help workers satisfy those learning objectives. You should notify workers that the training is intended to help them perform those learning objectives. You should create assessments to determine if workers can perform those assessments after training. And you should observe on-the-job behaviors after training to see if workers are performing those behaviors, skills, and/or procedures on the job. You should also take the time to learn as much about the employees (your learners) as possible before you develop training. Doing this will help you create training that’s well matched to their learning needs and preferences. There are lots of ways to do this, but going out, talking to them and asking questions is probably the best. Other methods that may help include sending out surveys or questionnaires, observing employees on the job, or even getting some information from their managers and/or the folks in HR. Research shows that, in general, none of these methods are inherently more effective than the others (see the classic book Evidence-Based Training Methods by Dr. Ruth Colvin Clark for studies, data, and statistics about this). Instead, you’ll often find that one type of training delivery method (instructor-led classroom training, for example) may be more appropriate for a particular safety training need, while a different training delivery method (online safety training, for example) may be more appropriate for a second safety training need. And in still other cases, you’ll find it’s best to deliver training in more than just method (such as introducing a topic with an online safety training course and then following up with an instructor-led classroom session). Because of this, it’s best to use what training experts call a blended learning solution for safety training. In short, this means picking the best training delivery method, or the best combination of training delivery methods, for each training need. When designing your training, don’t forget to keep stuff like this in mind. It won’t do you much good to create a fantastic, award-winning online safety training course if there are no computers for the employees to use to complete that training. Once you complete the design step, it’s time to roll up your sleeves and develop your safety training. This means to make it, no matter what delivery method you’re using (online training, written, video, written, PowerPoint presentation, instructor-led training, etc.). Make sure the information you’re including in your content is from credible sources. You’re probably already aware of this, but you shouldn’t include stuff in your safety training just because you heard it “somewhere” or because you read it on the Internet. Instead, make sure you’re getting your information from credible sources. We’ve listed some for you below. Earlier, we talked about the importance of creating learning objectives for your safety training. And we explained that a learning objective is what you want employees to know or be able to do when the training is over. We also mentioned that learning objectives should function as a kind of “road map” for your training. Amongst other things, that means that the training materials you create should be focused on helping employees satisfy the learning objectives. Your training materials should include everything necessary to help workers satisfy the learning objectives. Don’t leave critical information out. That second point, about keeping non-critical information out of your safety training is very important. It’s also a very common mistake. The reason for this rule is that people can only process a very small amount of information at any one time. It’s very easy to overload a person’s brain, and adding unnecessary information to safety training risks doing just that. To learn more about this, read our series of articles on how people learn (and don’t learn). Unless you’re working with children or teens, your employees are adults. And adults learn differently than children do. We’ve already mentioned how the human brain acts as a limit to the amount of information we can process and store at any one time. One aspect of this is that we can only keep information in our short-term memory for a short period of time. Distressingly short. As a result, it’s important not to drone on in your safety training. Do your best to keep it short and sweet. Don’t cover an entire regulation, but focus on what an employee needs to know to do his or her task safely. Trainers use the term “chunking” to refer to the process of taking training information, separating it into smaller, bit-sized “chunks” that are easier to process, and then putting them together in a logical order. Chunking helps you avoid situations in which the training materials overwhelm the processing capacity of your employee’s working memory. Obviously, if the employees at your work don’t all speak the same language, such as English, job one is to make sure they understand the language. In addition to presenting training in a language the employees use, it’s also important to present your training in familiar, conversational language that’s similar to how the employees speak. Our brains have one “processing channel” for language in either written or spoken form. And they have a second, entirely separate, “processing channel” for visual images. We can learn using either of these processing channels. Want a little thought experiment to prove it? You can imagine closing your eyes, having a friend explain something to you verbally, and still being able to learn from it, right? And you can imagine looking at a sign with visuals (but no language), having nobody speak, and still being able to learn from it, right? So both channels work for learning. The cool thing, though, is that if you use both at the same time, you can learn more effectively. As a result, it’s a good idea to create safety training materials to make use of visuals as well as language. This doesn’t have to be hard or sophisticated. For example, you can lead a session of instructor-led training and show an image in a PowerPoint presentation or even draw one on a white board. 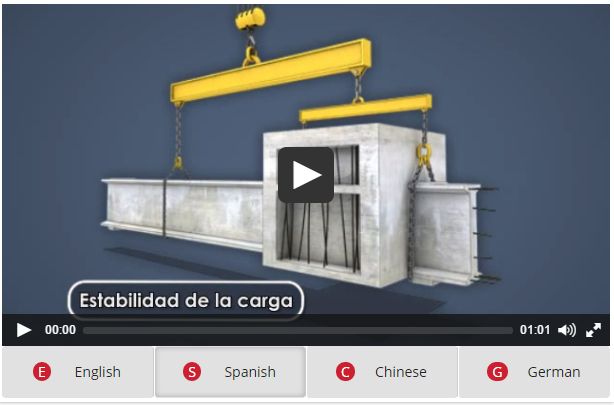 Online safety training courses are another great way to combine visual images and language to improve safety training, as the short sample below from a forklift safety training course demonstrates. When people are introduced to new information, their brain tries to integrate that information along with related information that was already stored away in the brain. 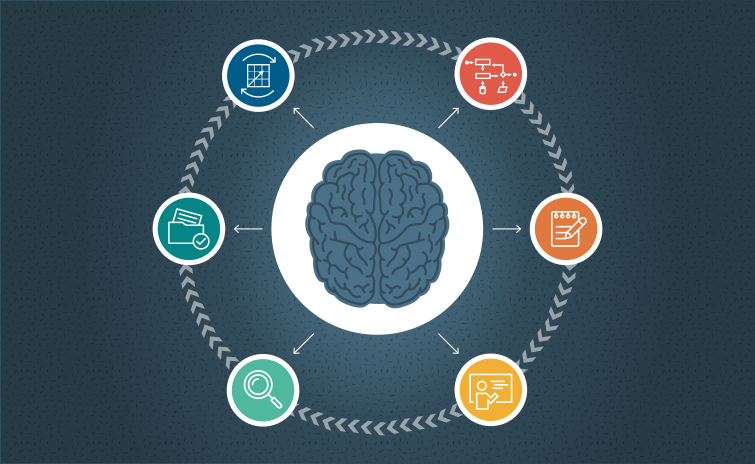 As a trainer, you can aid this process and make it more effective by prompting the employees to think about and “activate” that related information that’s stored in their long-term memory at the beginning of a training session. That makes it easier for the workers to make sense of the related, new information you’ll introduce during the safety training session. And it will make it more likely that the workers will successfully store that new information in their long-term memory. And that means they’re even more likely to remember that information and put it to use on the job, which is of course your goal. Here’s a quick example. Say you’re going to lead an instructor-led training session about working safely with chemicals at the workplace. You could start by asking the employees some questions about chemicals at work. What kind of chemicals are at work? What hazards do they present? Where could employees go to learn more about them? After the quick Q&A session, you could then begin your training about Hazard Communication. Humans seem to be hardwired to listen to and enjoy stories. And we’re more likely to remember things that we learned within the context of a story. That’s why story-based learning is such a powerful learning tool. And why it’s a good idea to tell short stories related to your topic during safety training, or to literally “embed” your safety training into a story. For more information, read this article on story-based learning and why you should use it. Or, to see a demonstration of how powerful storytelling can be in the context of safety, check some of these videos from the Chemical Safety Board, OSHA, and MSHA. It’s easier to make sense of new information if it’s presented in relation to stuff we already know and understand. Using what’s called “figurative language,” including metaphors, similes, and analogies, makes this easier. And so it will make your safety training more effective. People are active learners. That means we learn by doing. As a result, you should create training that includes built-in chances for employees to practice new skills, see the consequences of their performances, and receive supportive, helpful feedback. All in an environment that’s safe and protects them and others from any negative results that would result from making a mistake in a real work environment. Here’s a truth you probably already know about training: people forget stuff. They forget a lot of stuff and they forget it quickly. If employees at your company do this, it’s not because they’re bad learners. And it doesn’t necessarily mean they weren’t paying attention during training. It’s just that they’re human–which is probably a good thing, right? That’s why safety training shouldn’t be a one-and-one, once a year thing. And that brings us to the importance of refresher training and something called space practice (which basically means giving employees repeated chances over time to practice new skills). Bear with me here, because this gets just a tiny bit abstract. People learn better when they think about what they’re learning and how well they are learning it (or how well they understand it). This process of thinking about what you’re learning and how well you’re learning is part of what is known as metacognition. There’s a lot to say about this topic, but just knowing that your employees are more likely to understand and remember safety training if they self-monitor their own learning during training will help. To help employees with this, you can build-in moments into safety training where you invite workers to ask themselves how well they understand what’s being discussed. You may even provide pen and paper so they can write notes to themselves. This can be a useful way to make sure you’ve had a chance to address any confusions and uncertainties as well. As with all training, it’s important to remember that safety training should be matched to the learning needs of the learners. Keep this in mind whenever any kind of safety training is being delivered. What does that mean? Well, delivering learner-centric training means a LOT of things, but one biggie is the set of adult learning principles we already mentioned. Be sure to put these to use during your training. Want to take a deeper dive into information related to this training delivery? You might want to check this article on Robert Gagne’s nine events of instruction or this article about a similar, more recent list of steps of training based on cognitive psychology. Creating an active and engaging training experience is key for instructor-led training. Try to make the training engaging and interactive. And always be respectful to the employees and supportive of their efforts and contributions. Encourage conversations and sharing. As was true with face-to-face training, it’s important for online and virtual safety training to be engaging and interactive as well. Avoid passive, boring online safety training. Things to look for in online safety training courses include interactivity and the effective use of visuals, as demonstrated in the short video below. Many people in the workplace, maybe most, carry a mobile device such as a phone or tablet with them. In addition, many workplaces make these available to workers while they’re on the job. And there’s no reason to think this trend will do anything but continue. As a result, it makes sense to deliver mobile safety training online, and to make safety information available to workers while they’re on the job for performance support and as a job aid. 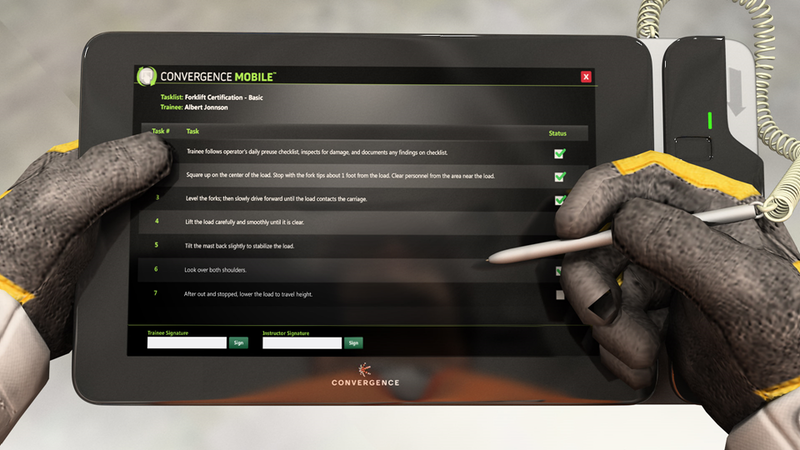 Mobile learning, also sometimes called m-Learning, can be a great addition to your safety training program. When creating or evaluating mobile learning products though, remember it’s best that the learning activities are short (remember our mention of microlearning before) and intentionally designed to be viewed on mobile devices. It’s also important that mobile devices include some form of interface that makes it easy for workers to find the specific safety training or safety information they’re looking for, as demonstrated above. Click to read more about delivering effective safety training. Once the safety training has been delivered, the task of evaluation to see if it was effective begins. Actually, that’s not 100% true. Because as you probably know, you can and should evaluate the effectiveness of safety training WHILE it’s being delivered. Are people confused? Are they glassy-eyed? Are they bored? So, keep in mind that it’s important to evaluate safety training real-time by observing and interacting with the employees as the training is being delivered. But in addition, consider this four-level method for evaluating the effectiveness of safety training. For those of you in the know, you’ll recognize the four-level evaluation method below as being based on the Kirkpatrick Training Evaluation model. These surveys are intended to get the workers’ thoughts about and opinions of the training. You can do these with pen and paper, with online survey tools such as SurveyMonkey, or even with surveys created inside your learning management system (LMS). This is a good practice, and useful information can be gleaned from these post-training evaluation surveys. Click the link to read our more detailed article about how to write better level-1 evaluations/smile sheets. Another level of training evaluation is to assess the workers’ ability to satisfy the learning objective(s) when the training is complete. In some cases, especially for learning objectives based on knowledge and/or awareness, this may include a traditional quiz or test. These tests can be delivered orally, on paper, or electronically using a tool such as a learning management system (many LMSs include quiz making tools to create your own assessments and reports that include data about completion, scores, and answers to individual questions). In other cases, the assessment will take place out in the field, as an experienced observer evaluates while the employee demonstrates safe work procedures. If they’re not, that’s not great. But don’t rush to judgment or criticize them too quickly. Instead, talk to them, make some of your own observations, talk to their managers, and find out why. It may be that the training was somehow ineffective. But there may be a different explanation. For example, maybe something in the work procedure prevents them from working safely, or maybe they’re receiving a different message from their manager in the field. Remember up near the top of this article, in Step 1: Design Your Training, we mentioned the importance of identifying the safety metrics that will allow you to measure if your safety training had an impact? Well, now it’s time to return to that. After your training has been completed, you’ll want to check those safety metrics and compare them to the same metrics when they were measured before the training. Are your metrics headed in the right direction? If so, good, that’s a sign your safety training was effective. If they’re not moving in the right direction, that’s reason to investigate further. It’s also important–and in many cases, legally required–to create and store records and other documentation related to safety training. Let’s take a closer look, in that order. ANSI Z490.1, the US National Standard of Criteria for Accepted Practices in Safety, Health, and Environmental Training, companies should establish a system for keeping and controlling documents and records related to safety training. In addition, Z490.1 suggests keeping records of training development, delivery, completion, and evaluation. We bow to the experts here. Here’s what they’ve got to say about each. You should also keep records of the periodic evaluations you perform of your safety training materials. Learning management systems (LMSs) can help you simply the task of creating safety training records. This video gives a quick explanation. In addition, there are some aspects of safety training record keeping that are more directly related to the employees. These include issuing certificates and credits, and the confidentiality and availability of those records. Any other information required by regulations, legislation, etc. Even if you faithfully perform the steps listed above, and even if your safety training is effective, it won’t be perfect. There will always be room for improvement. And that’s why it’s important to create a process for continuous improvement of your safety training. After all, effective safety training is great, but even more effective safety training is even greater. Even while you’re delivering training, you can be gather information to help you improve your training if necessary. Are employees “getting it” or not? Are they finishing your sentences correctly or are they staring vacantly with glassy, far-away looks in their eyes? What kind of questions are they asking? Next, you can use the information from each, any, and/or all of the four levels of training evaluation we just described above. Are post-training surveys being returned with employees saying they don’t know how to work safely? Are they failing the post-training quiz or test? Do on-the-job observations show that they’re working unsafely? Have your safety metrics stayed the same or gotten worse? All of this information can help you identify specific problems with your safety training. Use that information to improve your training, either by modifying the original content, by providing additional refresher training, or through some other safety training intervention. Finally, remember to update your training when processes, procedures, equipment, conditions, or regulations change, or if any other change that affects safety takes place. Effective safety training at a workplace doesn’t just happen. You need a dedicated effort from many people, and it involves an element of management. Let’s look at some important considerations for managing a safety training program. Admin & management personnel to administer and manage the safety training program. Training personnel with appropriate expertise to design, develop, deliver, evaluate, and improve the training. IT personnel for technical support with the platform and delivery system, especially if you’re using virtual/online training. Content and subject matter experts with appropriate technical information and resources for developing training on specific topics. Budgets and money for all aspects of safety training program. Knowledge of federal, state, and local agencies and their training requirements. Facilities where your safety training can take place. Technology to use during safety training, including any necessary PPE. Records of training, including creation and storage of records. Establishing a training management system for managing and administering the program in accord with recognized standards. Designing and developing safety training in an appropriate manner that relies on best practices of the training industry. Delivery of training by competent trainers in an environment that’s appropriate for training. Evaluating the safety training to determine if it’s effective. 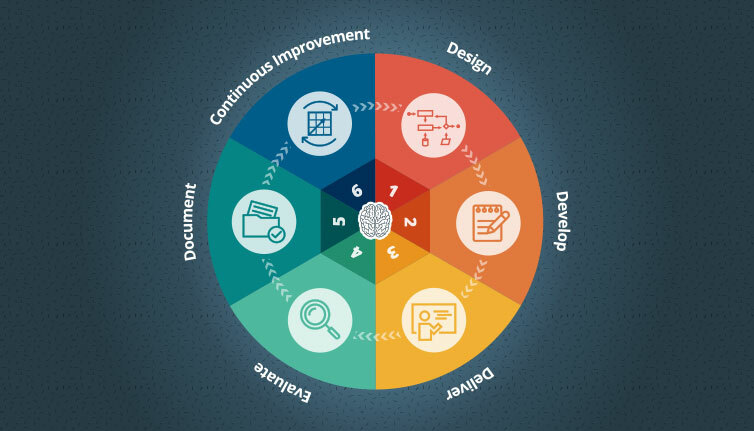 Creating and maintaining a continuous improvement system for the training and training program. Documenting and keeping records for all aspects of the training program. Creating a written training program that documents all of the above. Click to read a more extensive overview of managing an effective safety training program. Keeping these six steps in mind, and following them, will allow you to improve the safety training at your work. Which will mean a better workplace safety record. Which will mean, obviously, safer, healthier workers. All of which is good. We hope you found the article above helpful. Feel free to bookmark it and return later, to email it to a friend, or to share it on social media. We’ve also got a free, 60-page guide to effective Environmental, Health, and Safety Training for you below. Click and download, it’s all yours. Finally, let us know if you’d like some information about our libraries of online safety training courses. They’re ready for licensing and/or viewing today, they’re available in many formats, such as streaming video, USB, DVD, and AICC and SCORM for importing into a learning management system (LMS).